Sir David Attenborough has quite the naturalist pedigree but his greatest work has been in the field of broadcasting. Not content with developing traditional documentary, this effort turns his eye to 3D cinema - or more precisely, IMAX 3D cinema, fully immersing us into the world of South Georgia's penguin population. The added bonus of our 'Penguins 3D' screening? A post-film chat with Sir Attenborough himself, as vibrant as ever despite his advancing years. 'Penguins 3D' reflects the life of a male king penguin - the so-called "Penguin King" - returning to his birthplace ("Penguin City") and seeking a mate for procreation. His plight is surrounded by many obstacles including the harsh weather conditions and the island's fellow creatures, such as the predatory Skua birds. All narrated by the most iconic voice in nature television, Sir David Attenborough. Attenborough's involvement doesn't mask some of the film's failings - for example, the booming sound of the IMAX experience makes the repeated use of fart sounds an even more terrible idea in execution than in theory. Admittedly, 'Penguins 3D' is more directed toward family audiences and the children may remain engaged with the use of such gimmicks but perhaps a focus on some of the other animals may have had a similar effect - the elephant seals seemed particularly ripe for further investigation. Yet 'Penguins 3D' succeeds in many other respects, bringing us incredibly close to the variety of animals on the island - the vivid visuals effectively transporting us into its heart. As expected, Attenborough's narration helps further bring the scenes to life, aided superbly by an orchestral score that expertly moves between the contemporary and something akin to 'Songs Of Praise'. 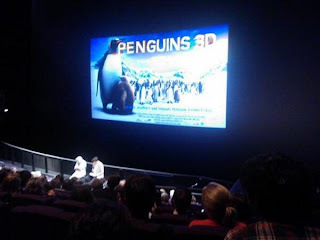 At just forty minutes long though, perhaps 'Penguins 3D' could have delved more deeply. Following the screening, we were treated to a Q&A with Sir David Attenborough, hosted by producer Anthony Geffen. With 87 of our Earth years behind him, you could be forgiven for expecting Attenborough to be a little reserved in this post-film discussion. Not the case. From his amusing quips about the fact that the King penguins were near-identical ("a huge plus" for filming) to his enthusiasm for the future of 3D (technology "improving all the time"), his answers were full of an unexpected vigour. Many of the questions that the audience asked led with a thanks - members of the audience now working in the natural world, mostly due to watching Attenborough documentaries from a young age - but Attenborough himself was quick to note that he was just one part of 'Penguins 3D' and any of his previous efforts. In such harsh conditions, the work of the camera crew such as director of photography Paul Williams (and the penguins themselves) arguably deserve the majority of the attention. Find more info on 'Penguins 3D' at sciencemuseum.org.uk.